You can count on Audrie Seeley & Company's commercial crews to get the job done and on time. Our installers have been in the business for nearly 30 years and have handled some of the largest projects in town. With our experience, we work diligently at keeping on top of the construction schedule, hitting completion dates to brush up before the ribbon cuttings and have a well-earned reputation for meeting budgeting goals. Look to Audrie Seeley & Company to get the job done right. 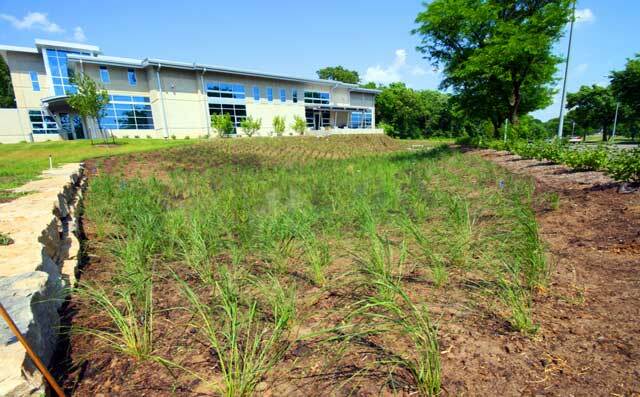 All are inexpensive and environmentally sound solutions to urban stormwater runoff. They collect storm water runoff from drainage areas such as roofs, driveways, and lawns. The water that pools in them nourishes the plants and absorbs into the soil reducing maintenance expenses. Best of all, they are environmentally conscious, look great and enhance your company's curb appeal.